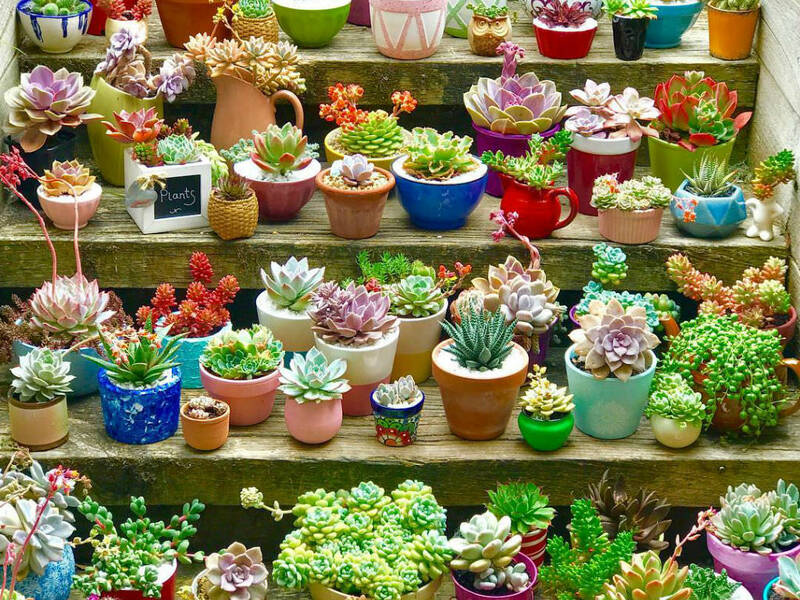 Growing succulents in containers allows you to bring your own little piece of the desert into your home or garden. Succulents look natural in western decors and landscapes. This diverse group of plants includes stiff, upright cacti as well as sprawling and trailing plants that are well-suited to hanging baskets and window boxes. Most enjoy a similar environment, but check the plant tag to see if your succulent has any special needs. Succulents grow well in almost any container that is at least 4 inches (10 cm) deep and has holes in the bottom for drainage. Choose a pot about 0.5 inch (1.3 cm) larger than the base of the plant for upright succulents. Plant succulents with spreading or trailing growth habits, such as Holiday Cacti, in a pot 1 inch (2.5 cm) larger than their original pot. Succulents need a loose soil that drains freely. Use a commercial cactus and succulent potting soil, or mix your own from 4 parts regular potting soil, 5 parts perlite and 1 part coarse builder’s sand. Spread a layer of small river rocks or aquarium gravel over the top of the soil to keep moisture away from the crown and prevent rot. You can water succulents planted in a soil that drains freely just as you would any other container plant. Saturate the soil completely and allow it to drain from the holes in the bottom of the pot. After the excess water drains, empty the saucer so that the plant isn’t standing in water. Allow the pot to dry out completely between watering. Succulents don’t need a lot of nitrogen because they grow very slowly. Feed them monthly with a cactus and succulent fertilizer. If you don’t want to purchase a special fertilizer for your succulents, you can use a high-phosphorous, low-nitrogen houseplant fertilizer mixed at half strength. Most succulents need a rest period of at least 2 months in winter. Place the plant in a room with cooler temperatures. Many succulents need winter temperatures below 60 degrees Fahrenheit (15 degrees Celsius) in order to set blooms, but don’t allow them to freeze. Reduce watering to just a drizzle around the sides of the pot or wet the top of the potting soil with a mister when the pot is dry. Withhold fertilizer during the resting phase.